Go to CamStudio (for example) and download the latest program; it’s free. Open the program and return to your Voki. Drag the box over your Voki and press Record. You can save your recording on your PC as a video file. You can then add it to a PowerPoint presentation, a website, or anywhere else for that matter. Give it a try! I was able to record my Voki using Cam Studio, but the sound is not being captured. Are there certain settings within Cam Studio that I should change? Hi Beth, or anyone else, did you find a solution to this? I can hear myself but not my Voki either using CamStudio. Any fixes? You will have to follow the instructions in the post! If you like, you can find an alternate screen capturing that you like to use! I embedded a voki in a PowerPoint presentation. It worked great, until I saved and left the presentation. When I reopened the presentation, the voki would not load up! Any ideas about how to correct this? Same thing happened to me. Anybody know why? We’re sorry to hear your having trouble embedding in PowerPoint. It sounds like these may be unique situations rather than a bug in the program so you will need to email support@voki.com. Please give as much detail as possible about what you are experiencing and we will work on a solution with you. how did you do that?? when I go to insert then to movie its suppose to say video from website but mine dont say that? You must be using the 2007 version of PowerPoint. The option for “Video from website” is only available on the 2010 version. Th easiest way you can embed your Voki on PowerPoint is using the direct Voki link or inserting your Voki as a video file. Those instructions are not from the Voki site, so I’m not sure they are correct or up to date. Please email support@voki.com and they will help you out. Send as much information as possible and a screen shot if relevant. I have used SMRecorder – it’s free, too and doesn’t us as much hard drive space as CamStudio does. You can convert the files to other video types, also. oops, SMRecorder doesn’t use as much hard drive space as CamStudio does. Thanks for sharing! I’m sure our Voki users will find this information useful! I ve used atube catcher for recording the screen. It works great! then I make a video with movie maker. The results was wonderfull !!! Try it! I would like to embed my Voki into my 2010 ppt. I can capture the code and paste into the insert box for video from web ok but the voki doesn’t play. Is it possible to copy the html code and paste into the developer? THis would not work for my Powerpoint 2013. Any other suggestions? I got it working, I followed the instructions of Powerpoint 2007 for 2013 version. It worked perfectly!!!! Hi im having trouble with the sound as it seems that have disappeared. Please Help. Please send us an email to feedback@voki.com! We will look into this issue! Hello…I am trying to embed a voki into ppt 2013. It is different from 2010- can anyone tell me how to do this?? To insert a Voki into PowerPoint 2013, follow these instructions: 1. Visit http://www.voki.com. 2. Click the Create button and create your Voki. 3. Click Publish after you are done with creating your Voki. 4. Highlight and copy your Voki embed code. 5. Open word document and paste the embed code. 6. Find the value code with a hyperlink. 7. Select and copy the hyperlink. 8. Open PowerPoint and click on File to open up the menu for PowerPoint and click on Option. 9. Click on Quick Access Toolbar. 10. From the Choose commands from: drop-down menu, locate and click the Developer Tab. 11. Locate and click on More Controls and click Add. It will appear on the top menu. 12. Click on More Controls. 13. Select Shockwave Flash Object. 14. You will see a + sign as your mouse cursor. Click and drag on the PowerPoint slide. This will create a big box with an X in the middle. 15. Right-click and select Property Sheet. 16. Find the Movie line and paste the Voki hyperlink into the blank area. 17. Find EmbedMovie and set it to True. Then close the Property window. 18. To view the Voki on your PowerPoint, press the F5 button on your keyboard. Note: To play your Voki using the embed code, you must be connected to the internet. Hola, he creado mi voki y quiero insertarlo en el PREZIS, pero no consigo, como puedo incrustarlo? Hey, is there any way to get a voki vid on youtube with out recording? Nope! It’s not possible. This is the only way to save Voki as a video! There are other Voki characters that are free! You may want to check out our fantasy, anime, and oddball characters! can i add voki into a mp4 video?? If you followed the instruction to save your Voki as a video file, you can use a video editor and edit the different videos together. i have made a speaking character and publish it .but now don’t find it any where.pls reply. How do you embed a voki in powerpoint 2013? Please take a look at this blog post for instructions! Does anybody know if there is any way to put a Voki in ApprenNet? It would be in video form. I saw earlier where people were using SMS Recorder and CamStudio. I am a neophyte in all of this, so I would like the simplest answer possible. I do have to use ApprenNet though; I’m just not sure how to put (embed?) the Voki in there or if it is even possible. Thanks! 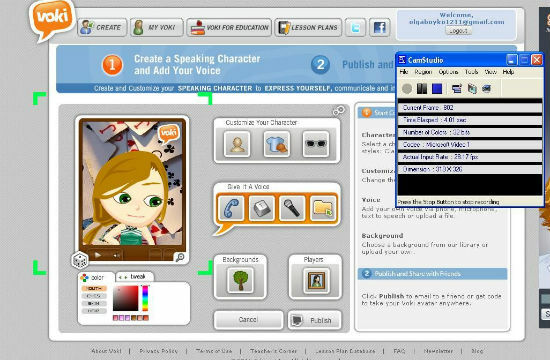 I have selected my character and completed all I needed to do but twice now I receive the message that says, ALERT, This model is only available to Voki Classroom or presenter users and I can’t publish. Also our instructions is to NOT choose one with the graduation cap in the corner which I did not. So what is happening? I hate to keep trying all these and find out I can’t use. help! Is there a way you can add it to a website creating site? Like weebly.com? I was able to create my Voki and add audio to it but, how do share a live link of my Voki say for a school assignment online for example? Beware of cam/studio/yes it is free-it will work, but beware they will load your computer up with malware-ad ware, be sure you have some type of malware remover once you have used cam studio-or uninstall it after you are done. How do I embed a Voki video on my Weebly website?